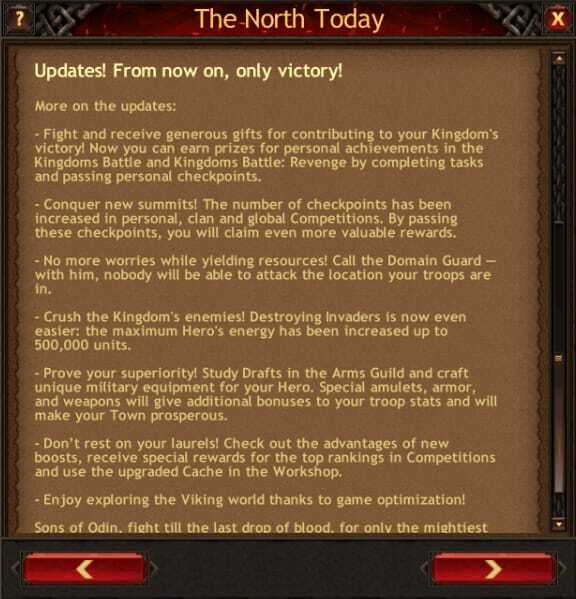 In the lands of Vikings: War of Clans, resources are the lifeblood of any great town and thus the Jarl who rules it. They are these resources that you will need to continue the production of your troops, to advance the buildings within your towns and increase your influence within our realm. Resources are needed, at all times, and this cannot be denied. 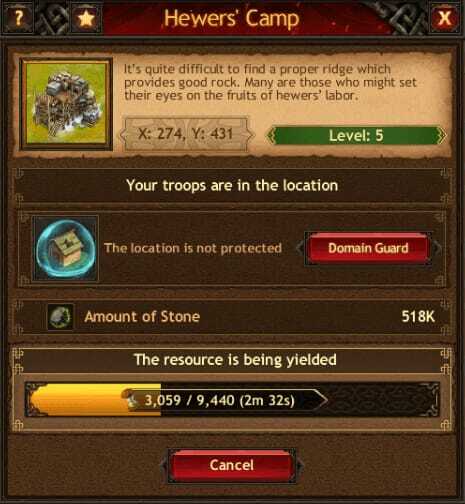 The primary means of acquiring resources is from what are known as "resource locations", or "tiles" as many warriors within the realm would call them. These tiles contain a specific resource, or material that you will need to enrich your town and feed your hungry forces. To gain them, all one must do is seize them as one’s own and gather the materials over an extended period of time, which varies based on the amount of troops that you send to that location. Yet it is not this simple, as many have learned far too late. These locations are only as well-defended as the troops that you send to them, and thus, your forces are vulnerable as they attempt to gather the desired material that they are harvesting. To counter this, Jarls have typically only sent small batches of low ranking T1 troops, to lessen their risk of being "caught" and attacked by their many enemies. Fortunately, a brand new innovation has been created by the realm’s greatest minds. The era of the Domain Guard is here, and with it comes a new sense of security and peace of mind. 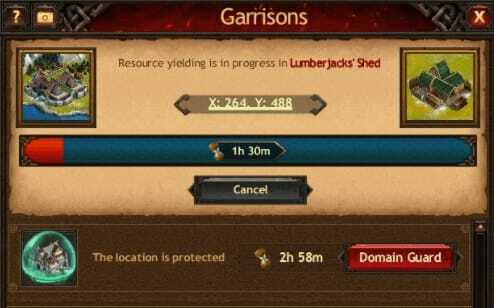 As the name implies, the Domain Guard is a spell of protection that can be cast upon the resource location that your troops are currently harvesting from. They come in varying times, that ranges from one hour, to three hours. However, these items cannot be simply bought at a whim--they can only be acquired through blood, sweat and tears. To gain them, one must compete in the Kingdoms: Battle Revenge Global Competition. They can be gained from the personal event if you Kingdom wins, and also from your clan event, no matter the outcome of the competition. Once activated, your troops will be invincible and will not be able to be ambushed by those who would see harm befall upon you and your forces. 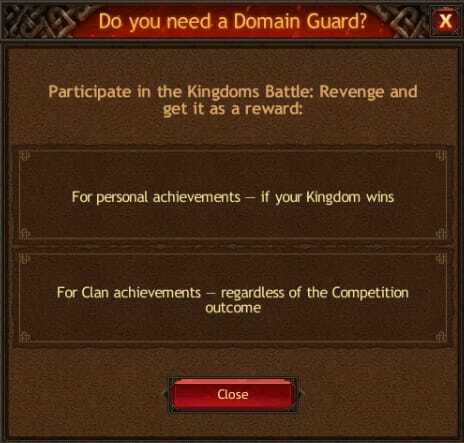 The stakes for winning these Kingdom vs Kingdom events were already incredibly high, but now, the spoils of victory have become all the more lucrative. These highly-sought-after items have the ability to increase your potential wealth dramatically and usher in a new age of confidence for both you, your citizens and the Jarls who make up your army.